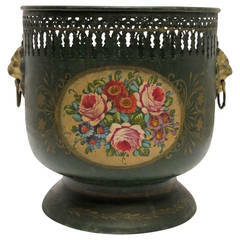 The traditional Classic antique ceramic cachepot was crafted in France, circa 1870; round in shape, the large faience vase has a wide mouth at the top, a beveled lip, and is hand painted with detailed floral and bird motifs in a blue and white palette. The elegant timeless vase is in excellent condition and flaunts richly patinated colors in the Gien style. The versatile piece is signed on the bottom for further authentication, and would make a lovely addition to a table or console in a home of any style. Measures: 12.5" Diameter 11" Height. Elegant French porcelain cache pot with the under plate with a neoclassical pattern, circa 1850.